Applications like biotech, laboratory instrumentation, medical, and semiconductor depend upon high-accuracy, high-resolution positioning. We serve these markets with a variety of precision stages from marquee suppliers. We will work with you to determine the correct match or make adjustments to available products to better suit your positioning needs. Purchase of one of our precision stages doesn’t end when the box leaves the shipping dock. 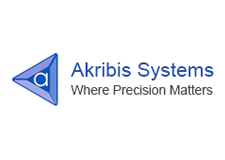 Our application engineers will work with you to ensure proper installation and integration into your system to achieve the performance you expect. Screw-type actuators convert rotary motion to linear motion using a nut on a rotating screw. Turning the screw with a rotary motor causes the nut, and whatever is attached to it, to move relative to the screw. Screw-type actuators are commonly used in positioning systems for a broad range of applications including packaging, converting, medical, laboratory instrumentation, semiconductor, and test equipment. 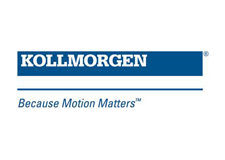 Screw-driven precision stages can deliver accuracies as high as 2 µm. Although lead screws tend to be limited in length to a meter or so, with large enough screw diameter, they can handle loads of better than a thousand pounds. The screw thread pitch introduces a significant mechanical advantage, which can eliminate the need for gearboxes in many applications. Each screw has a critical speed that is a function of diameter, thread pitch, etc. Past this critical speed, the screw bows outward as it rotates in what is known as screw whip. Paired with the right application, though, screw-type actuators can be effective and budget friendly. 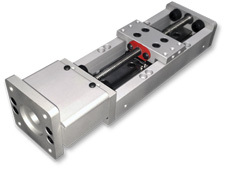 Belt-driven stages are ideal for applications requiring long distances and high speeds. Belt drives can easily travel 50 feet or more. They can operate at high speeds without the disadvantages of screw whip. 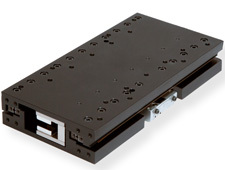 Belt-driven actuators are also significantly cheaper than other technologies. On the downside, they lack the mechanical advantage introduced by screw-type actuators. As a result, belt-driven systems frequently need gearboxes. This can negate the cost savings of using a belt drive. Adding a gearbox also introduces mechanical error as a result of factors like backlash, hysteresis, and compliance due to couplings. Many belts require routine tensioning. 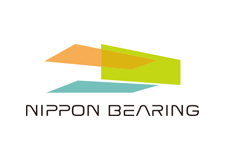 They are not recommended for vertical applications because of the risk of load free-fall in the event of belt failure. 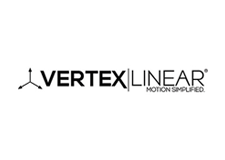 Linear motors generate linear motion directly, rather than requiring an actuator to convert rotary motion to linear motion. They are essentially unrolled servomotors, with the stator, or forcer, riding along a magnet track. They are available in ironless models, in which the forcer travels in a U-shaped magnet track, and iron-core models, in which the forcer travels along a line of magnets that are attached to an iron backing. Iron-core designs deliver more force but suffer from a high degree of cogging as a result of the iron core. Ironless models provide very smooth motion but with less force. 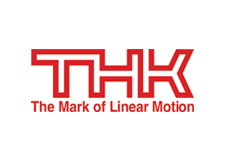 Linear motors offer accuracies on the order of 0.5 µm, with speeds as high as 5 m/s. In theory, the length of the magnet track is unlimited; in reality, consideration like the cost of magnets and an appropriate linear bearing impose practical limitations. 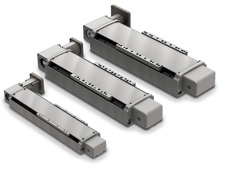 Because linear motors do not require coupling to an outside actuator, they typically exhibit significantly less compliance than rotary motor-actuator combinations. On the downside, the need to have an open slot for the forcer to move in the magnet track can make them vulnerable to contamination.